Buy shares in Gaffa Tape, now! WHO says you need a £10,000 motorcycle to tour Europe? Not Conrad Evans who is aiming to cover seven countries in 48 hours on a motorcycle he bought for £50. 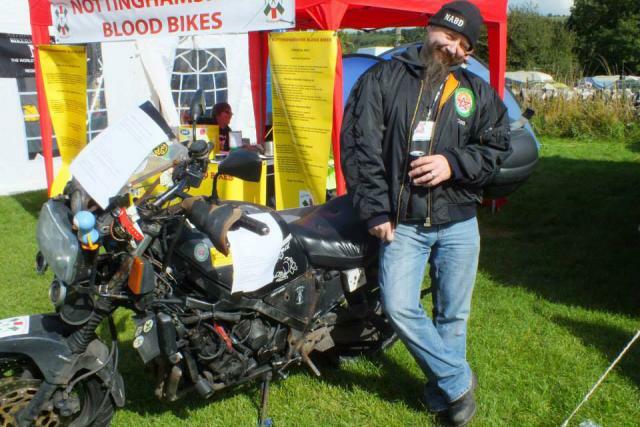 Volunteer Blood Bike rider, Conrad Evans, will blaze a trail across Europe on his 24-year-old Yamaha FZ750 and he hopes to raise £5,000 for Nottinghamshire Blood Bikes in the process. Starting in his home town Nottingham, Conrad will ride to Wales to meet members of Wales Blood Bikes group before heading off to the tunnel, into France and up through Belgium, Holland, Luxembourg and finally into Germany. All the money raised by Conrad will go to Nottinghamshire Blood Bikes who aim to deliver urgently required medical products for NHS hospitals in Nottinghamshire, free of charge.